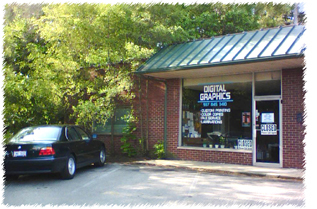 Established in 1988, Digital Graphics is your complete source for business and personal printing. With over 20 years experience, and a genuine respect for our craft, we’ll make you look good ...on paper. Specializing in graphic design for business sales development, we also print: carbonless forms, invitations, catalogs, newsletters, resumes, menus, labels, flyers, brochures, postcards, envelopes, yard signs, posters, banners, computer checks & forms, magnets, business cards, and more. We also offer complete fax/e-mail services, laminating, binding, rubber stamps, and “Copies-While-You-Wait”. In addition, we can now provide web site hosting & design. own projects from our automated sites. Stop in for Copies While You Wait OR simply attach your file to an e-mail, including specs for your project (quantity, paper size and stock etc.) along with a contact phone number. We’ll give you a call to verfiy specs and price and let you know when it’s ready. No complicated online forms to fill out.